$1100 for a full fledged service PLUS Comrade and Big Mamma will give you four hours of photo coverage of the event and you get ALL the pics on a CD or DVD… no reprint fees! One half payment is due at time of scheduling event. Remainder is due after the service. Comrade and Big Mamma on their honeymoon trip to Sturgis, SD for the 2003 Rally. I have been thinking of weddings the past few weeks… my youngest sister is tying the knot and I am going to officiate. You see, about four years ago I went ahead and became an ordained minister on-line. Why? Well it just seemed like the thing to do. Plus, it would allow me to perform weddings for my Brothers, if the situation arose. As it turns out, they have been more in the market for divorce lawyers than wedding officiants, but that is another story all together. 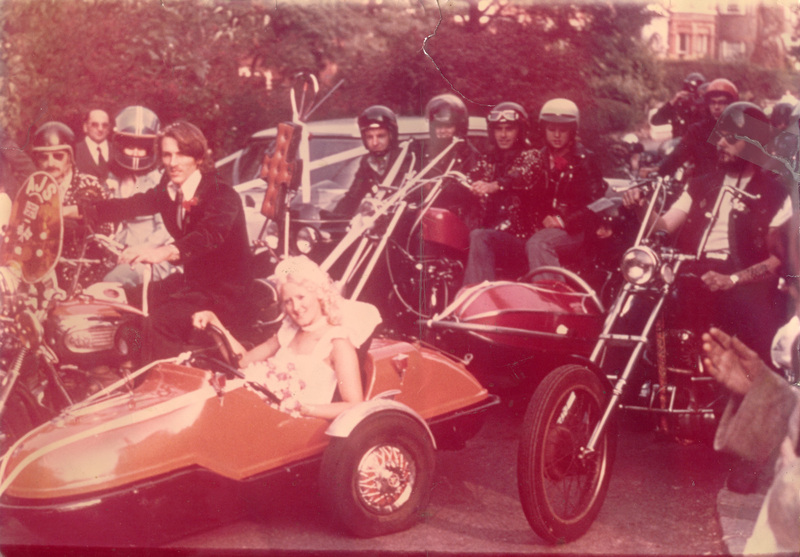 For any of you who have not witnessed a biker style wedding, it is something to see. There are many varieties, styles, and levels of commitment to the motorcycle culture that can be included. 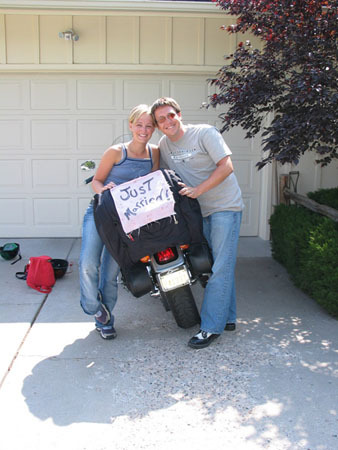 From couples who have a passing interest in riding because of recent television exposure who might include some decorative element; to the serious riders and enthusiasts who may tailor the ceremony to their passion, even including motorcycles in the ceremony itself; to the hard-core types whose wedding more closely resembles a club run and binge party than any type of formal, or even organized, ceremony. I suppose the most common ceremony that might be considered a “biker wedding” is either one that takes place at a major rally or motorcycle event or a wedding in which motorcycles play a large part in the ceremony itself. For example, the wedding party often arrives at the venue on their bikes and park on either side of the “aisle.” The groom and officiant may arrive on their own bikes and await the arrival of the bride to be. She may also arrive by bike. Whether she arrives by foot or two wheels, the wedding party will rev their engines as she comes down the aisle… the biker version of the wedding march. The officiant will call for the silencing of the engines and begin the ceremony. The bride and groom almost always use their own vows, rings may be exchanged, and the wedding party lights up the bikes as the new couple finishes the ceremony and takes their first walk (or ride) back up the rows of bikes as husband and wife. My Ol’ Lady and I had a non-traditional wedding and we spent the following few weeks traveling from Houston to the Dakotas for our annual pilgrimage to Sturgis. It was a fantastic honeymoon that included a stop in Linton, North Dakota to celebrate Big Mamma’s new last name. While my little sister does ride, she and her fiancé have planned a beach wedding rather than a biker wedding. It is going to be beautiful and the whole family is looking forward to getting out of Houston and the aftermath of Hurricane Ike. Have you or someone you know held a biker wedding? If so, I would love to hear about it. I know many of our readers would also be interested. By the way, if you are interested in having me officiate your wedding, just drop a note to save the date. And, a quick search for “bike wedding” will give you a few nice websites with great info and ceremony ideas.